Celebrating our first Valentine’s Day engaged brings back memories of the first one that we celebrated dating. Trying to find the perfect gift for each other can be particularly challenging, especially during this holiday. And since I was a broke college student at the time, finding a CHEAP perfect gift was essential but limiting. My best option was a DIY project which would work out great since, in my opinion, they are much more thoughtful and appreciated. So after much pondering and searching (and a little help from Pinterest), I came up with the idea of giving Lane a fishing tackle box. But instead of filling it with fishing gear I decided to fill it with gummy worms, blue whales, Swedish fish and assortments of other fish related goodies. 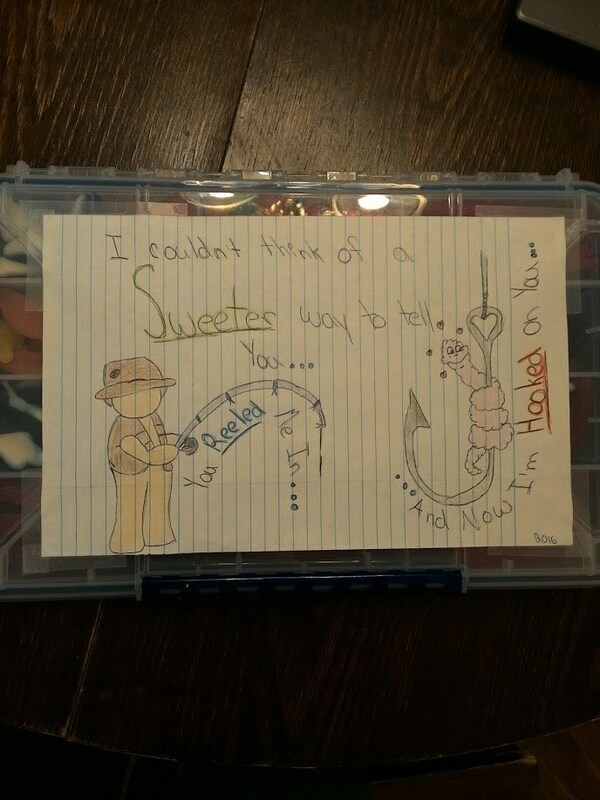 I wrote a witty saying along the lines of, “I couldn’t think of a sweeter way to tell you…you reeled me in…and now I’m hooked on you” and attempted to draw a cute picture. As I was sitting at my kitchen table the day before Valentine’s Day, freaking out that I would not get it done in time, I started thinking about why people celebrate this holiday to begin with. It is not about how big, shiny, extravagant or expensive the gift is. Sometimes the best gifts are not even gifts at all but rather the feeling that someone truly appreciates you being around, which in the end is the reason for the holiday. Lane loved the tackle box that I gave him that Valentine’s Day and I loved the chocolates, card and beautiful roses that I received. In the end, it was a very successful, romantic and memorable Valentine’s Day for the both of us.